This design will also be eventually found on my Brown Drake patterns. I noted on the other post that this pattern design was inspired by both the Dette Coffin Fly and the Coffin dry fly presented on Plate No. 13 in Trout by Ray Bergman. 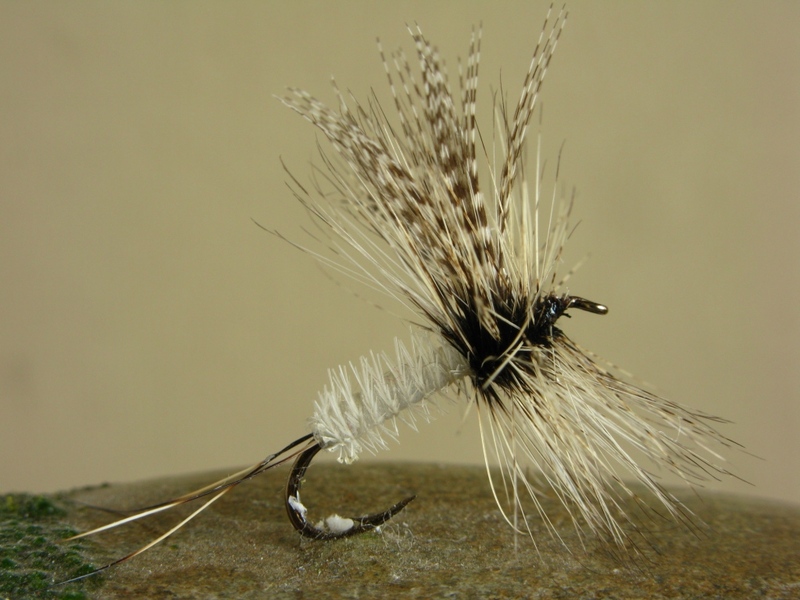 Dette Coffin Fly – an original tied by The Dette’s Fly Shop in Roscoe, New York. The hook is a size #12 – 3x long. This fly was a gift from my friend Bill Havrilla, of Pennsylvania. 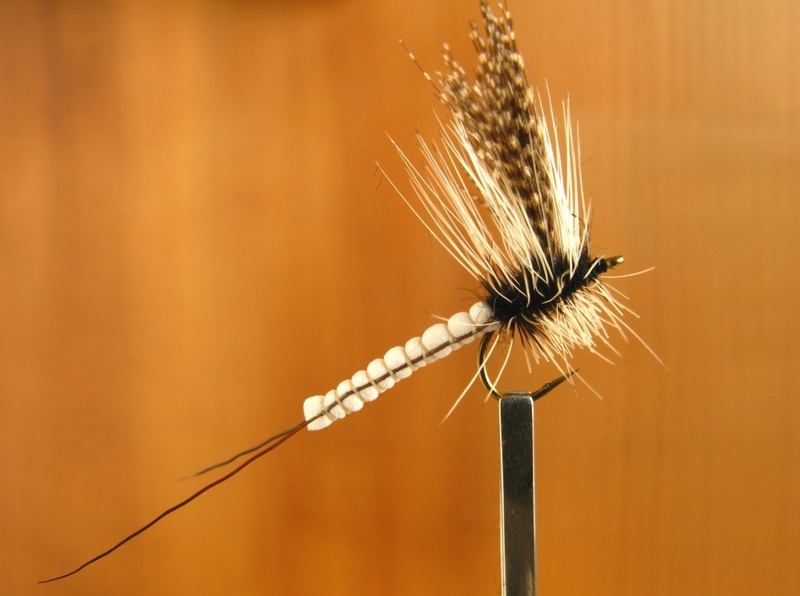 The pattern design of my BXB (Bastian Extended Body) provides for the creation of a larger mayfly, but on a smaller hook. The short-shank hook allows for more realistic imitation of the natural, and also enhances presentation by providing a lighter weight fly, that presents and drifts on the water more naturally than a standard large-hook fly pattern. The soft-flexible closed-cell foam abdomen does not impede setting the hook. In fact the smaller hook results in more hookups, not less. Four BXB Green Drake Coffin Flies, card-mounted, ready to be boxed up for sale. End view of the carded Coffin Fly selection. That rather messy line drawing under the tails is my signature. BXB Green Drake Coffin Fly. The best solution for tying instructions of the foam abdomen is for me to do a video…yes, it will be forthcoming. In time. It’s actually very easy to make these. I make these bodies, with tails, in less than two minutes. The tails are the hardest part. Start by making 4 – 5 wraps of tying thread on your mandrel. Then do a two turn whip finish, cut tag end. Take the foam strip, size it to be about 3/4″ in length, and make one wrap, straight across and over the top. Advance your tying thread at a 45-degree angle underneath, then make another wrap, straight across the top of the foam. Repeat, making 7 – 9 segments, evenly spaced, and then a bit closer near the tail, until you arrive at the base of the abdomen. Take two fibers of moose body hair, make the tails about an inch long, even the tips, and using a horizontal finger pinch with your thumb and middle finger on your left, or opposite hand, bring the tail fibers close to the foam, holding them on the sides, and make a balanced thread wrap, that is, use just enough tension to catch the moose hair and pull it into place alongside the abdomen, but not so much tension that the hair is forced to move out of position ahead of the tying thread. Once both fibers of hair are captured with the thread, pull tight to flare them, and then advance the thread forward, repeating your forward wraps over top of the same segments created on the first series of wraps. When you arrive at the final front segment, make a two-turn whip finish and slide the body off your mandrel. I make these up ahead of time by the dozen, by the score, even by the half-gross. To finish the fly, start the black tying thread at the hook eye, wind a thread base, and then attach the abdomen above the barb, using maximum wraps to secure the body with no spinning and no rotation of the body. It’s got to be lashed down tight. Then I place a very small amount of dubbing, enough to make just 3 – 4 wraps in place, right ahead of the abdomen at the attachment point. 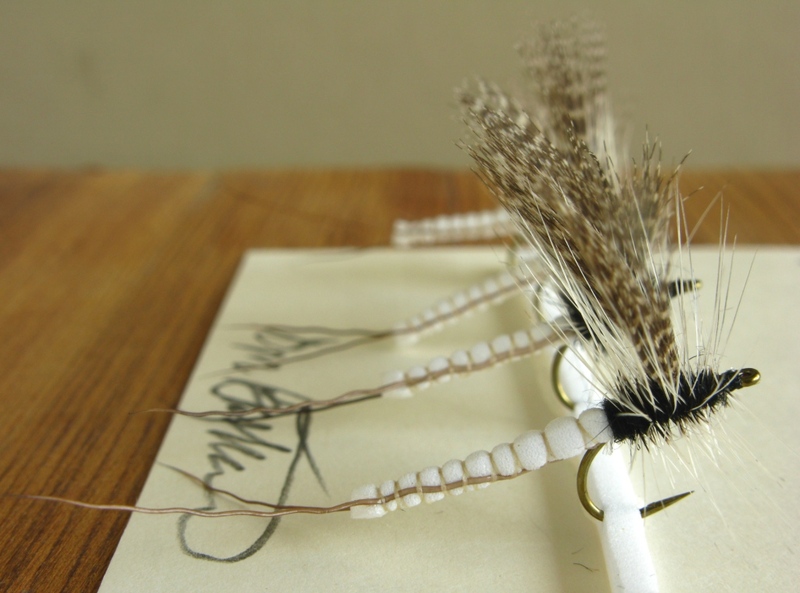 Next attach the hackle, having about 3/16″ of the fibers clipped off the stem at the tie-in point. Make sure you leave some of the clipped section of the stem behind or to the rear of the tie-in point. This will ensure that the hackle fibers do not start to flare until you have made at least a half-wrap with the hackle stem. Then mount the wing feathers, one at a time, sizing them to be about 3/4″long. Stand them up by damming thread in front, then make a figure-eight wrap, and post around the base of each wing. Add head cement to lock the wraps down. Finish the fly by applying the dubbing. I go through the wings with lightly-dubbed thread once. Wind the hackle, making a total of eight to ten wraps, evenly spaced. Make a nice, small, smooth head, and the fly is ready to fish! This pattern is a good Green Drake fly to have in addition to spent-wing Green Drake spinner patterns. This entry was posted in Dry Flies, Fly Pattern Recipes and tagged BXB Green Drake Coffin Fly, Dette Coffin Fly. Don, those are amazing. That BXB Green Drake Coffin fly is my favorite of this page. Gorgeous work, all of them. I love all of these. I have never seen them before. I bet they work, as well as look good too. Thanks for your comments…you never saw them before because I doubt if you have Green Drakes in Texas. 😉 They are one of the most beautiful of the mayflies…the Coffin Flies, with their basic, stark black and white contrast, in the fading evening light, present an amazing sight, especially if you happen to witness them in numbers. The patterns are pretty as well because of the simplicity of the colors. 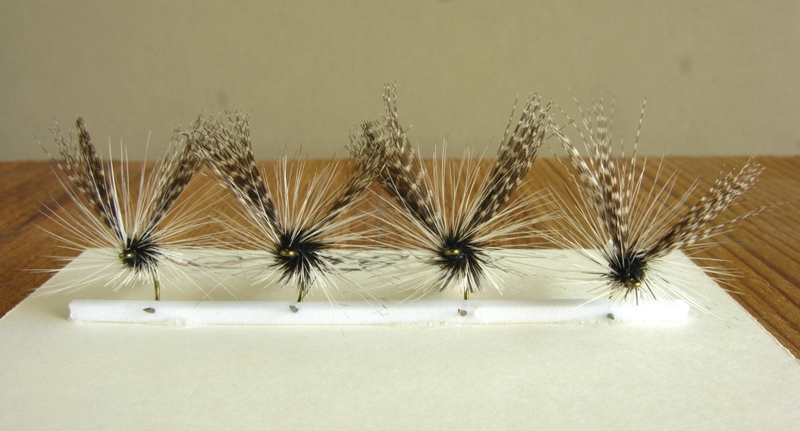 There are also very few drys that use badger hackle. That fact makes these pattern somewhat unique. Thanks again!